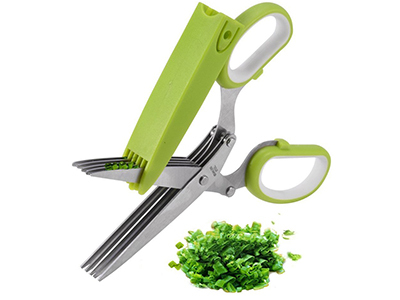 This Heavy Duty Herb Scissors feature a set of Five Sharp " long Stainless Steel Blades. 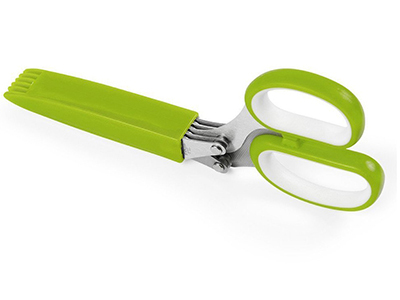 The handles are made of Sturdy Bright Green Plastic with a Soft Silicone Lining for the Most Comfortable Grip. Comes complete with a protective Blade Cover that doubles as a Cleaning Tool. 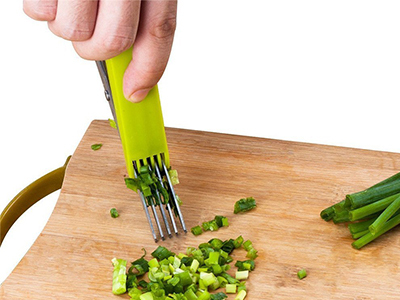 Say good-bye to tedious cutting and chopping. Put your knives away! 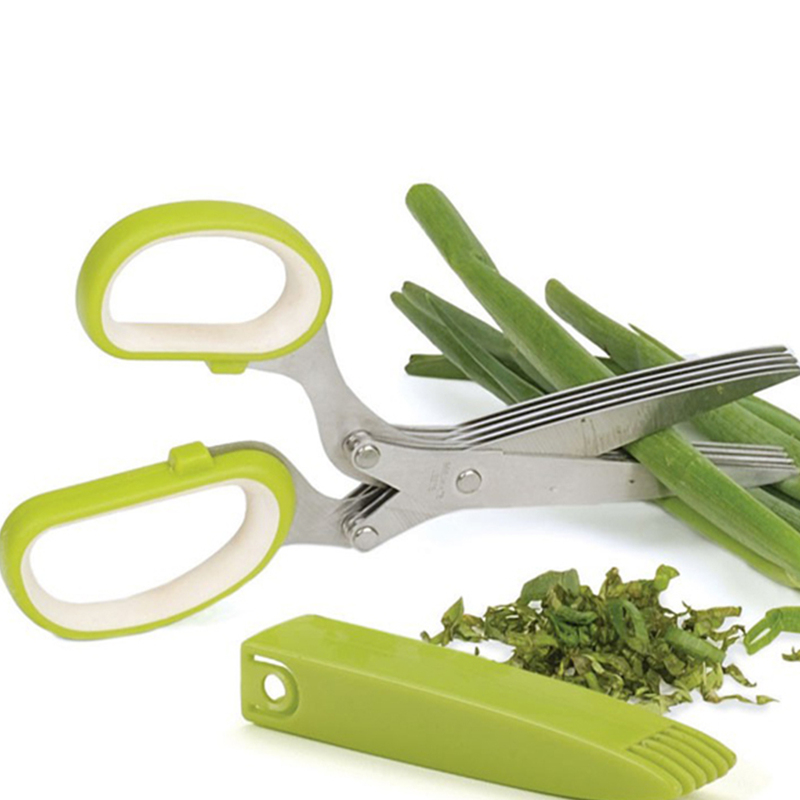 Snip herbs directly onto plates and pans with this easy to use herb kitchen scissor, Garnish your meals like a pro! And do it fast–keeping flavors crisp and clean, all while preserving healthy benefits of fresh herbs. 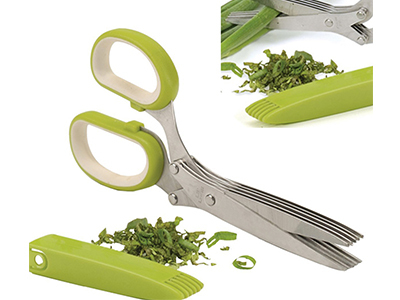 This Herb scissors is ideal for Cutting, Chopping and Mincing Herbs in no time! Works great on Basil, Thyme, Dill, Parsley, Chives, Mint, Fennel and many more. Also can make gorgeous arts & crafts, shred paper or make ticker tape. 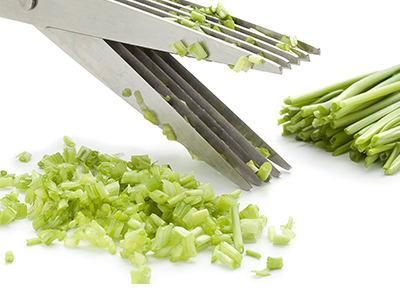 Herb Scissors make cutting herbs fast and easy. To create masterful meals because it is so easy to trim, snip, and shear nutritious food for you and your family in mere seconds. Cut, chop, or mince herbs directly into a pan or garnish over a plate to unlock your fresh herbs' full aroma and health benefits. The little green brush with long fingers makes sure you quickly get through the blades and get all your herbs where you want into the dish. Stainless steel sharp blades cut perfectly sized pieces . A protective Blade Cover that doubles as a Cleaning Tool.Easy to clean,brush away any herbs clinging to blades. Adding such ingredients will not only give a twist of flavor but also provide amazing health benefits. Your Chef Trusted herb chopper is the best gadget for preparing these disease-fighting vegetables and spices on any dish. Green onions, thyme, sage, oregano, chives, and mint on your dishes to have a unique taste that will make it a course bursting with aroma. Adding these natural ingredients will provide a lot of difference on the taste of your recipe. Snip herbs in perfectly sized pieces right onto plates and pans. Like the finest restaurants – garnish with finesse! Impress your family and friends. But hide your clever herb cutting scissors or they will take them home!